In this post , the words ‘project’, ‘research’, and ‘researcher’ should be read as ‘GCRF-funded project’, ‘GCRF-funded research’ and ‘GCRF-funded researcher’. My post–facto comments are in block quotes. Click the thumbnail images to see full-size versions. The following is the agenda Mark circulated. As the workshop progressed, a few topics were tackled earlier than expected. The post follows that order. 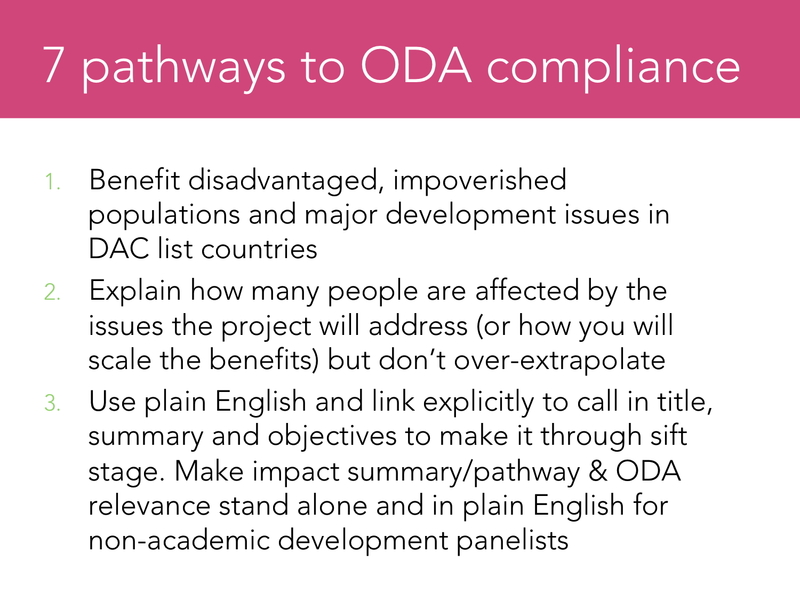 Discussion: what is impact – for Overseas Development Assistance (ODA)? 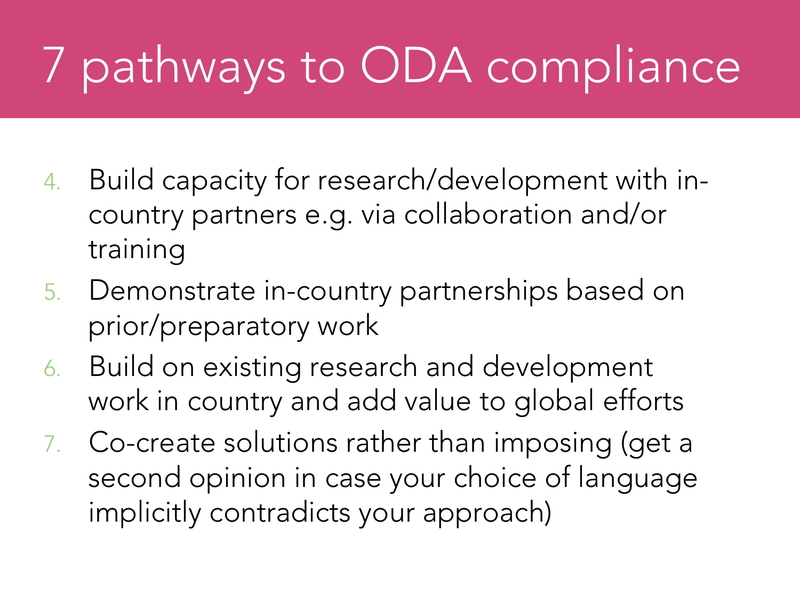 What makes a good pathway to impact underpinning ODA in a GCRF proposal? Designing and facilitating partnership meetings and workshops with stakeholders that are easy to facilitate, efficient and enjoyable. 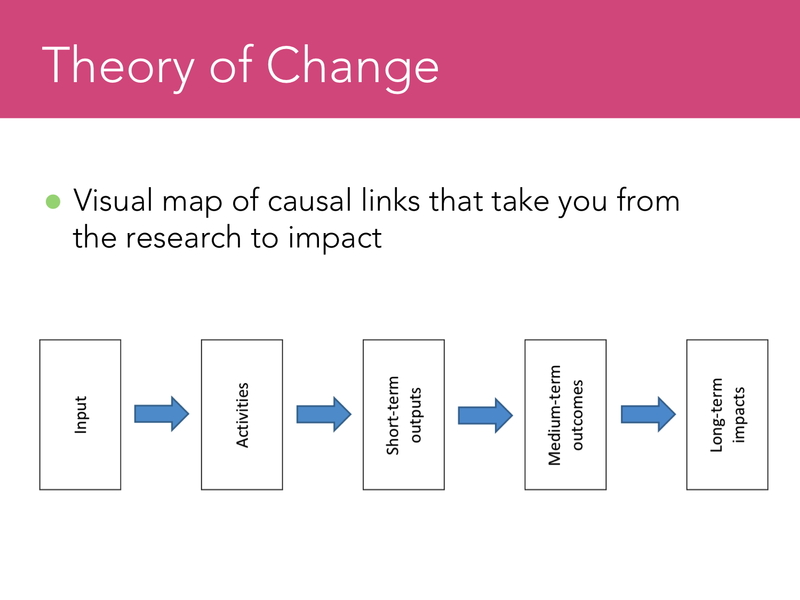 Impact is the benefit of research. Hence it is not the pathways to impact, but what the research project will actually do for people and other beings. 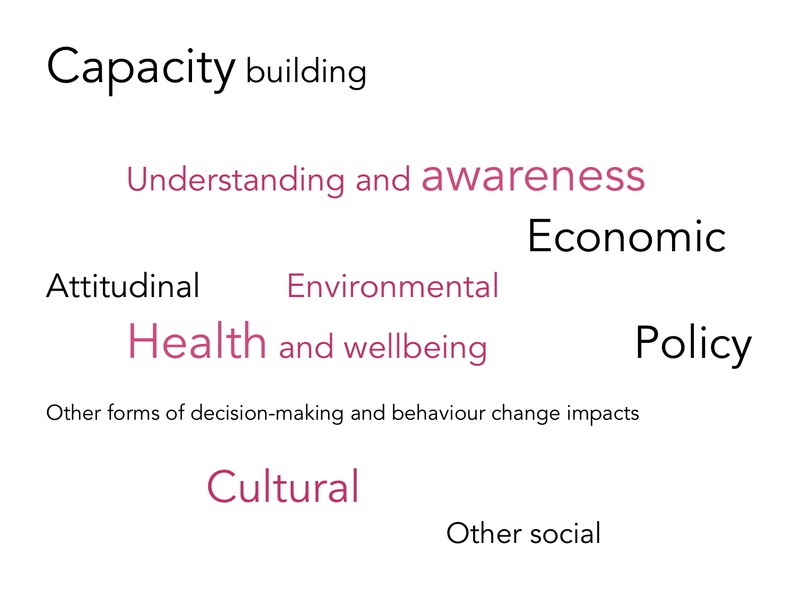 So impact is the aim that underpins research. the pathway (how benefits will happen). When planning a project, researchers should co-develop desired impacts with the proposed beneficiaries so that benefits are genuine. They should also be aware that there may be disbenefits or harm resulting from their research. Another definition of research impact is ‘the good that researchers do in the world’. So researchers need to share their findings with others to increase their understanding of the issues they face. GCRF requires non-academic beneficiaries but not exclusively. That is, there can also be academic beneficiaries, for example training new researchers to enable further ‘worldly’ benefits. Mark replied that increased ‘awareness and understanding’ impacts on their own are worthwhile but will not score highly with GCRF funders. They also need more tangible benefits such as ‘increased awareness and understanding, leading to better wellbeing, increased security, better decisions. I realise that we can argue until the cows come home, make the dinner and repaint the ceiling about what ‘better decisions’ means. Mark also advised that researchers should be realistic, so they should watch out for risks and assumptions in their funding proposals. He noted that the GCRF funding panel accepts that nothing is guaranteed. My colleague Wegene Demeke suggested there could be impact on professional practice. Hence such researchers should gather early evidence (i.e. a baseline), then look for evidence of impact. Mark then suggested there is a typology of impacts, as in Figure 1. He added that if risks and disbenefits arise, researchers and colleagues should mitigate them, ameliorate them or simply decide whether they are a price worth paying for the benefits of the research. 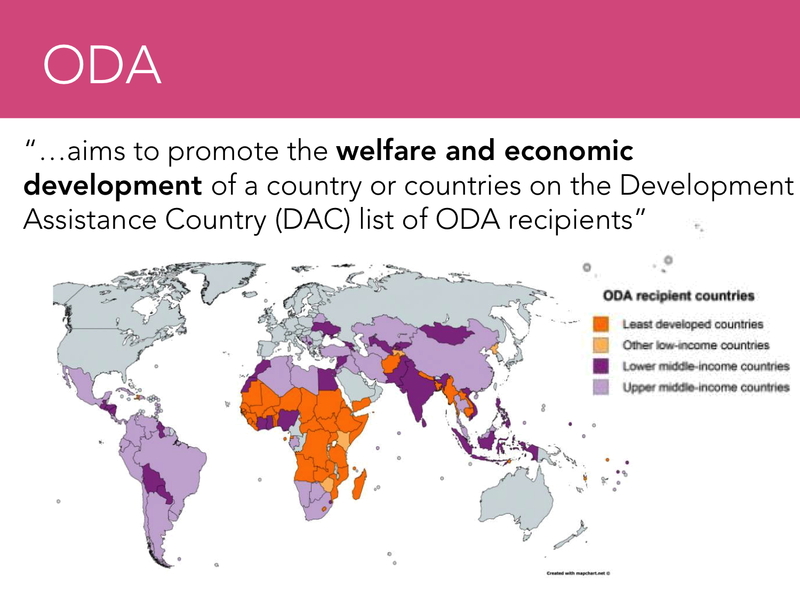 ODA is about welfare and economic development impacts, as shown in Figure 2.
the project would be fundable. Such projects can be framed in terms of the ecosystems services framework, i.e. as ‘natural capital’. Surely reducing the value of nature to an economic value, as that framework apparently requires, is abysmal. It subordinates the universe to humanity, and implies, for example, that happy beavers are only worth as much as the powers-that-be are prepared to pay for them. Mark later added he understands my distaste here but that a GCRF call linked to the Life on Land SDG, with clear biocentric goals in the call for proposals may fund research that is less anthropocentric. human rights, good governance and social justice. 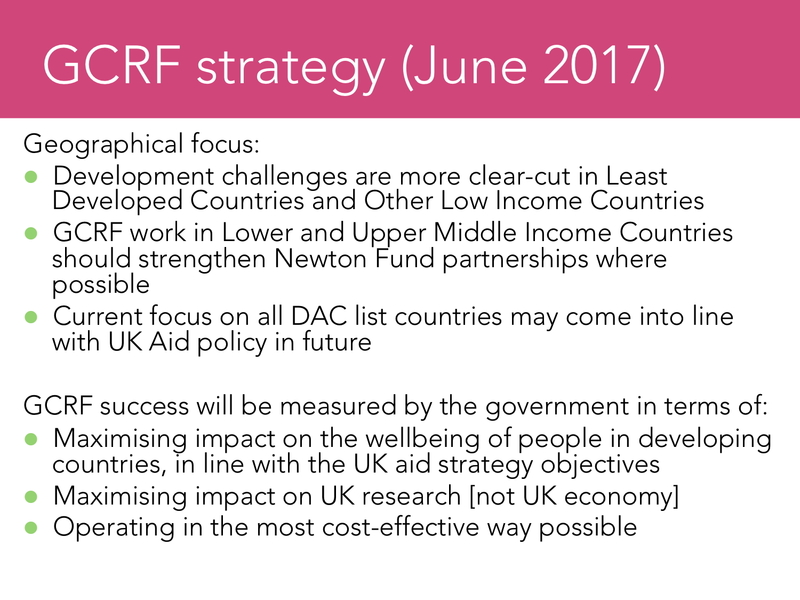 Currently, GCRF isn’t aligned with UK aid objectives. However, this position may change. To ensure success, applications must satisfy the development practitioner on the review panel, so the project gets a high ‘GCRF-relevance’ score. So it is advisable to find out who is on your panel. but should show credible evidence of why they are needed, e.g. for robust project management. 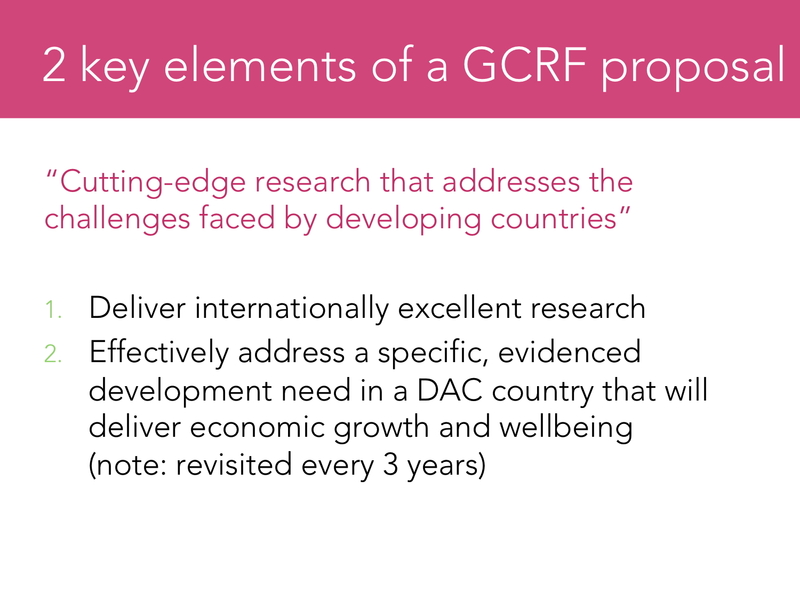 Other relevant parts of the GCRF strategy are shown in Figure 3. The project team should be in place as soon as possible, because the windows for submitting applications are often very short. This includes getting ‘pre-reviewers’ (people who can comment on the likely success of an application, often dedicated research-support colleagues) in place. Pre-reviewers may also be non-academics. Another valid part of team-building is building capacity with colleagues who are relevant to DAC countries. 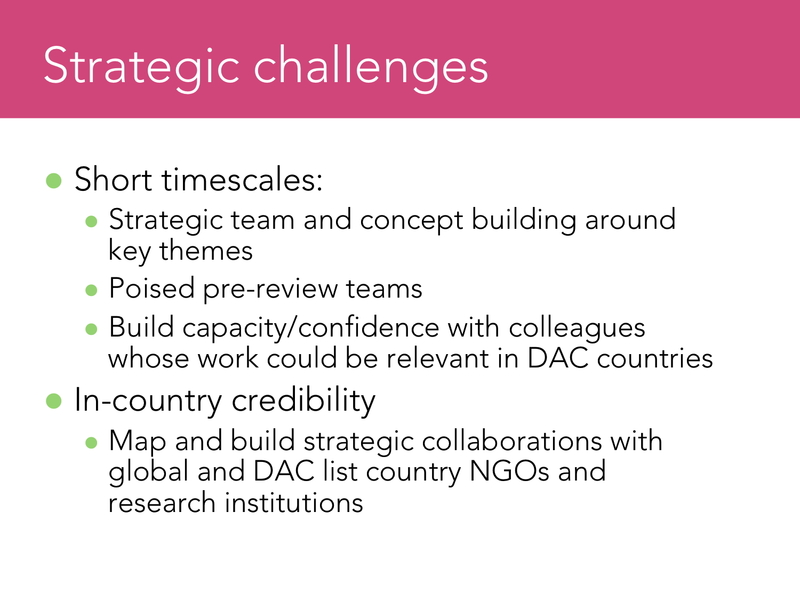 This and other ‘strategic challenges’ are shown in Figure 4 below. More advice on this topic is contained in Mark’s book The Research Impact Handbook. Researchers should be aware that certain sections of the media attack and belittle GCRF research. They should also be aware that they may challenge the powers-that-be. According to a colleague, I will know my PB research is effective when I am ‘disappeared’ by Mr Bolsonaro. co-create systems, not impose them. from colonial master to unenlightened natives. Readers should also check out the Fast track Impact Resources section. The example is apparently similar to a benefit dependency network. 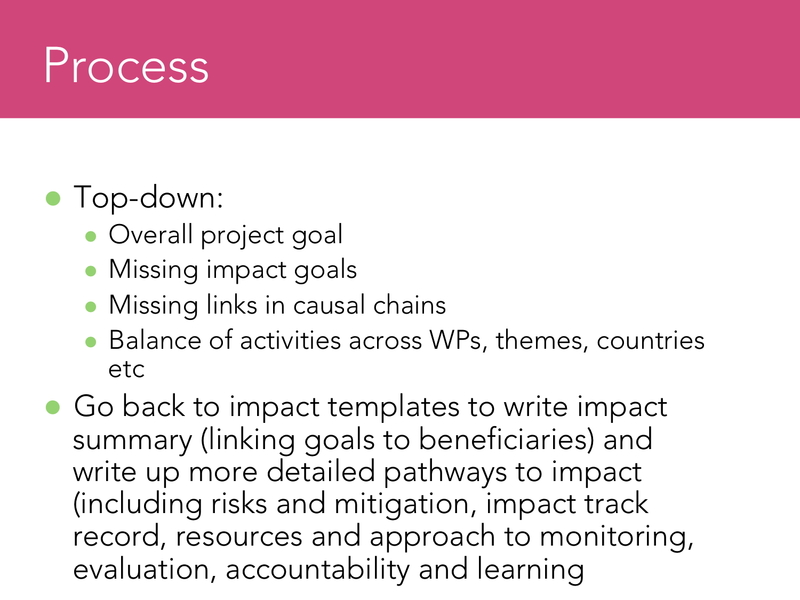 The impact-planning process can be either bottom-up (Figure 11) or top-down (Figure12). ensure there is at least one activity leading to each impact goal. Websites and twitter feeds often do nothing for in-country beneficiaries. (They may not have the know-how or facilities to access online resources, especially if they are written in English.) If this is true for the project being created, it’s hardly worthwhile bothering with them, and they certainly shouldn’t be seen as pathways to impact. It is crucial to capture all impacts as they occur. Researchers could use Mark’s impact-tracking template (Word | PDF | Figure 13). Researchers should use a tool that suits them and their colleagues to do this. Tools can be as simple as an email folder or a spreadsheet. However, Mark suggests that Evernote is an efficient tool. or that the pathway is being used – metrics can’t of themselves prove that people are benefitting from what they read online. See also chapter 22 of the Research impact handbook. 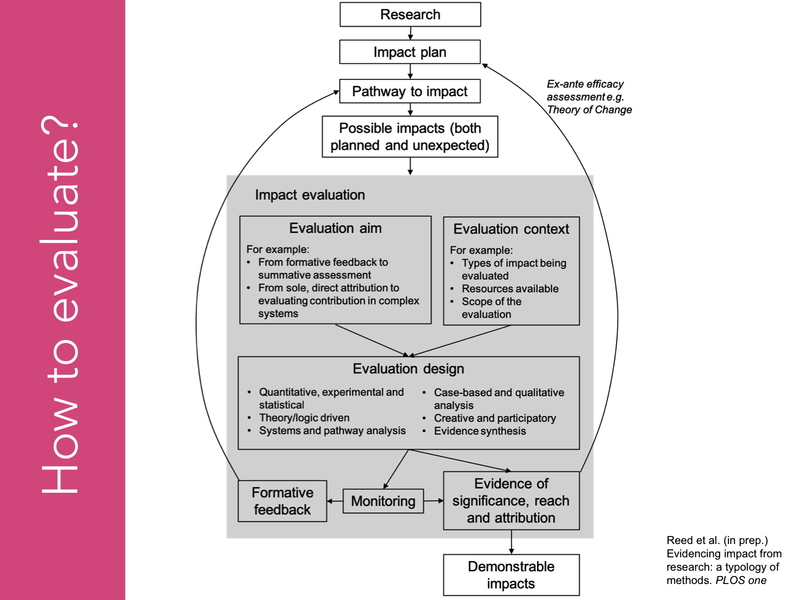 A definition of evaluation is given in Figure 14 and a way of using evaluation to demonstrate impact is given in Figure 16. The techniques chosen must be believable. It’s often valuable to hire a good facilitator, because this can prevent a lot of problems and costs. The facilitator should have high emotional intelligence. A good agenda is also needed. One the biggest issues researchers might face is power-dynamics. Researchers should watch out for cliques and leaders. For example, cliques may well sit together. Leaders may sit at the head of their tables, appear more confident, be observed and obeyed by their ‘minions’, and may appear to say ‘impress me!’ by using their phones or laptops when researchers might hope they are paying attention. Researchers should be aware that body language and clothing are function of culture. (For example, a powerful person might choose to show rejection of convention by wearing a t-shirt when convention demands a suit and tie. Researchers might think it worthwhile rejecting such power-dynamics but they should consider whether this will frustrate their pathways to impact. For example, it may not be possible to avoid the leader being the only speaker in any meeting he attends, but it should be possible to meet separately with his ‘subjects’. Alternatively, the researcher could intervene to allow the subjects to speak. Another technique is co-devising rules at the start of a meeting. Then if anyone breaks them, the researcher can call on the moral support of the whole meeting to shut up a loudmouth. Alternatively, ranters can be asked to quiet down now by promising them a turn during ‘any other business’. Therefore meetings should have built-in contingency time. 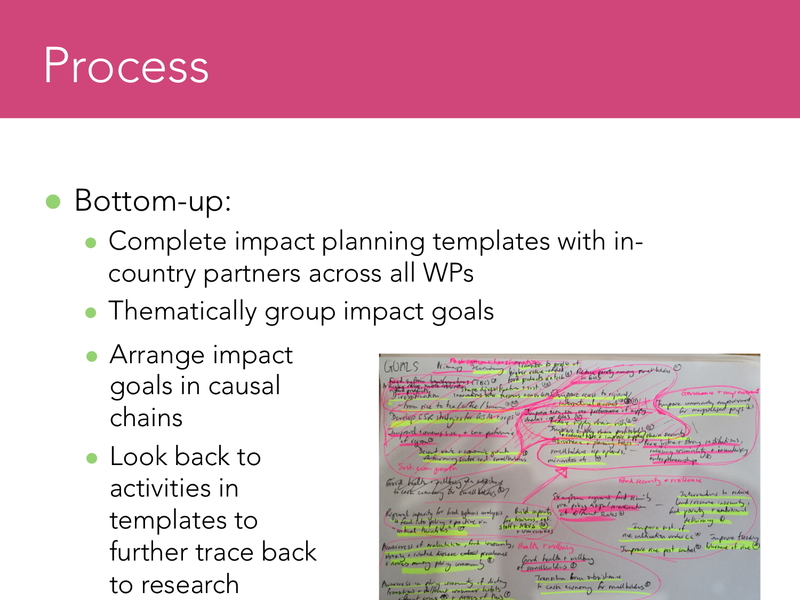 Participants can be asked to write down their ideas on a big sheet of paper on the wall before the meeting starts, so every topic is considered at an appropriate time. If the facilitator messes up, the PI or senior researcher present should take over. He or she will have to take complaints anyway, so it is best to minimise these and keep the meeting on track by intervening as soon as it is necessary. The facilitator or researcher should have a ‘bag of tricks’ (post-it notes, pens, etc) to enable rapid effective interventions. 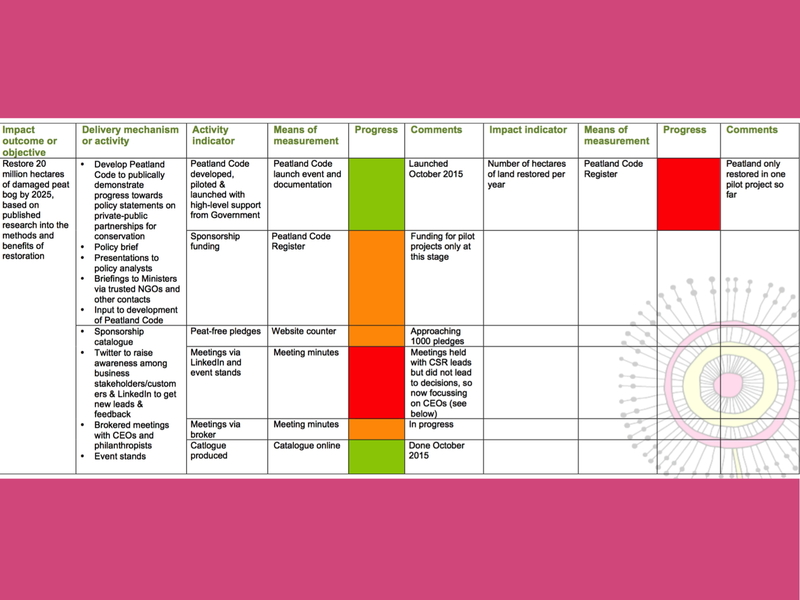 When prioritising things, it may be helpful to use dotmocracy. 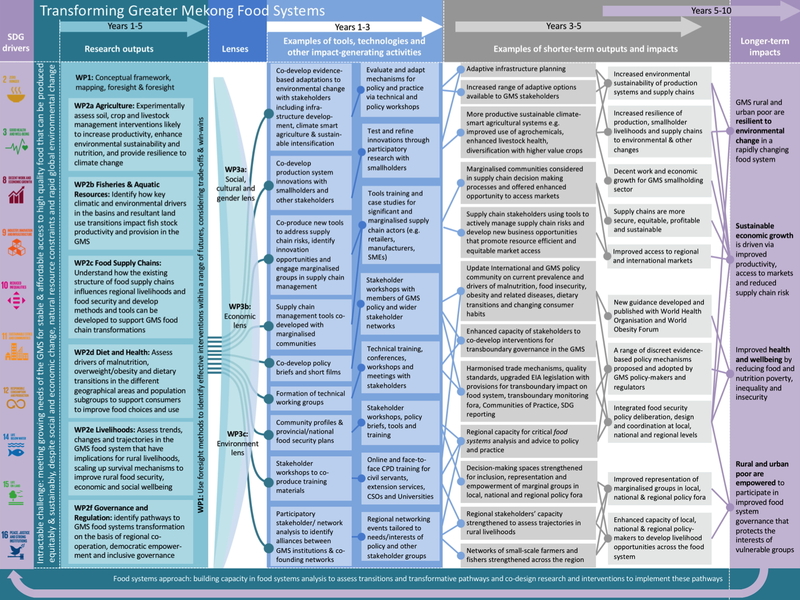 This entry was posted in other research and tagged GCRF, Global Challenges Research FUnd, impact, Mark Reed, ODA, Overseas Development Assistance by Bruce Ryan. Bookmark the permalink.